The many factors that lead to child labor occur on a global scale. Although countries may agree on the importance of labor standards, in practice, many obstacles to the enforcement of child labor standards remain. These obstacles include global competition, free trade rules, and the structural adjustment policies attached to international development loans. As multinational corporations expand across borders, countries often compete with each other for jobs, investment, and industry. International competition sometimes slows child labor reforms by encouraging corporations and governments to seek low labor costs by resisting enforceable international standards and repressing trade union activism. Many labor unions and other organizations are concerned that this global “race to the bottom” increases poverty while lowering labor standards. Since the 1980’s, incomes of the richest 20% of the population in nearly every nation have grown, while incomes of the middle and lower classes have stagnated or declined. 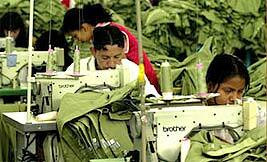 These workers sew at a maquila, or sweatshop in Central America. Many Central Americans have been trafficked into forced labor situations, including sweatshops, where they toil under harsh conditions of indentured servitude. Most child labor occurs because children and families are poor and lack options for education or income. Many factors affect poverty, but international agencies are increasingly paying attention to trade policy as a key factor. The 2003 UN Human Development Report, for example, identifies “unfair trade rules” as one of four key obstacles to economic progress in poor countries. Many poor countries rely heavily on exports of primary commodities, which have suffered from declining prices as global competition has increased and markets have tightly concentrated with a few firms dominating key sectors. For example: world coffee prices hit 100-year lows in 2002-2003. These extremely low prices depressed economies in parts of Central America and Africa that depend on coffee exports, and child labor in some regions reportedly increased. Poor countries often face staggering interest payments on development loans from the World Bank and the International Monetary Fund. These loans often require the countries to follow the policies of structural adjustment programs: deregulation, opening trade and financial markets to global competition, weakening labor laws or enforcement, privatizing government jobs, and cutting government spending on public health programs and education. Such structural adjustment policies can intensify the conditions, such as poverty and inadequate education funding, that lead to child labor. Debt is one factor, in addition to war and disease, that may lower school attendance in Sub-Saharan Africa (where 48 million children under 14 work). For example, Malawi spends 40% of its GDP to repay foreign creditors, while only 15% of GDP is spent on healthcare and education combined. In the 1990’s, the number of children entering primary schools declined in 17 African countries. Educational materials containing information on Child Labor and the Global Economy, including Workshop Materials—International Trade and Child Labor and K-12 Teachers’ Materials, are available through this web site. These materials include Power Point presentations, instructors’ manuals, activities, and handouts. You may adapt these materials to your group’s needs.